Agreement Ledger An agreement ledger is distributed ledger used by two or more parties to negotiate and reach agreement. Alt Coin An alt coin is a Bitcoin alternative. There are many hundreds of alt coins currently being marketed. Attestation Ledger A distributed ledger providing a durable record of agreements, commitments or statements, providing evidence (attestation) that these agreements, commitments or statements were made. ASIC ASIC is an acronym for "Application Specific Integrated Circuit". ASICs are silicon chips specifically designed to do a single task. In the case of bitcoin, they are designed to process SHA-256 hashing problems to mine new bitcoins. A protocol allowing users to exchange cryptocurrencies with one another. It allows users to cross-trade different cryptocurrencies without relying on centralized parties. Bear (Bearish) A prediction that the price of a coin will decrease. Bitcoin (BTC / XBT) The well known cryptocurrency, based on the proof-of-work blockchain.Bitcoin is the first decentralized, open source cryptocurrency that runs on a global peer to peer network, without the need for middlemen and a centralized issuer. Bitcoin Maximalists The truest believers in bitcoin’s original mission and design, often paired with a disdain for altcoins. Block Blocks are packages of data that carry permanently recorded data on the blockchain network. Blockchain A blockchain is a shared ledger where transactions are permanently recorded by appending blocks. The blockchain serves as a historical record of all transactions that ever occurred, from the genesis block to the latest block, hence the name blockchain. Block Reward A form of incentive for the miner who successfully calculated the hash in a block during mining. Verification of transactions on the blockchain generates new coins in the process, and the miner is rewarded a portion of those. BTFD “Buy the F*cking Dip.” Advice to other traders to pick up a coin that’s presumably hit its bottom. Central Ledger A central ledger refers to a ledger maintained by a central agency. Cipher an algorithm used for the encryption and/or decryption of information. In common language, ‘cipher’ is also used to refer to an encryption message, also known as ‘code’. Confirmation The successful act of hashing a transaction and adding it to the blockchain. Consensus Consensus is achieved when all participants of the network agree on the validity of the transactions, ensuring that the ledgers are exact copies of each other. Cryptoanalysis Cryptoanalysis is the study of methods for obtaining the meaning of encrypted information, without access to the secret information that is normally required to do so. 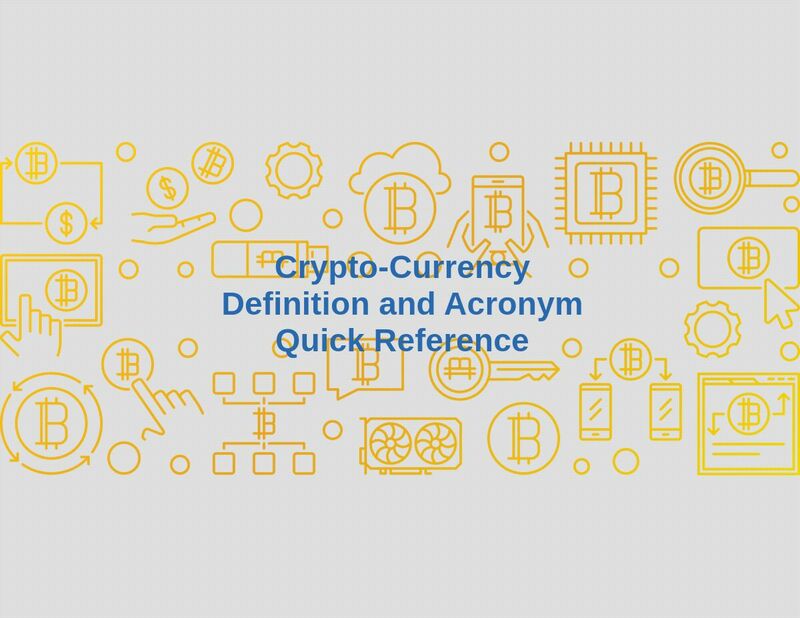 Cryptocurrency Also known as tokens, cryptocurrencies are representations of digital assets. Cryptographic Hash Function Cryptographic hashes produce a fixed-size and unique hash value from variable-size transaction input. The SHA-256 computational algorithm is an example of a cryptographic hash. Dapp A decentralized application (Dapp) is an application that is open source, operates autonomously, has its data stored on a blockchain, incentivised in the form of cryptographic tokens and operates on a protocol that shows proof of value. DAO Decentralized Autonomous Organizations can be thought of as corporations that run without any human intervention and surrender all forms of control to an incorruptible set of business rules. The DAO (yes, there’s a difference) was a venture capital fund built on Ethereum that caused a soft and hark fork. Day Trade The term for trading AltCoins on trading platforms on a consistent basis to try to gain higher wallet %. Difficulty Difficulty, in Proof-of-Work mining, is how hard it is to verify blocks in a blockchain network. In the Bitcoin network, the difficulty of mining adjusts verifying blocks every 2016 blocks. This is to keep bitcoin block verification time at ten minutes. Digital commodity is a scarce, electronically transferrable, intangible, with a market value. Digital identity is an online or networked identity adopted or claimed in cyberspace by an individual, organization, or electronic device. Distributed Network A type of network where processing power and data are spread over the nodes rather than having a centralized data centre. #DYOR “Do Your Own Research.” The trader’s caveat that advice shouldn’t be taken at face value. Ethereum "The Other Blockchain"...Ethereum is a blockchain-based decentralized platform for apps that run smart contracts, and is aimed at solving issues associated with censorship, fraud and third party interference. EVM code isthe programming language in which accounts on the Ethereum blockchain can contain code. The EVM code associated with an account is executed every time a message is sent to that account, and has the ability to read/write storage and itself send messages. Exchange Where you Buy or Sell bitcoin and altcoins to or from your bank or credit card or from various coins on the open market. There are internal wallets yet the exchanges have the private keys to the wallets so it's never safe to store the cryptocurrency on these exchanges for a long period of time. Flipping The term for constantly rotating your AltCoins on a trading platform trying to catch the raising percentages as the coins constantly go up in value. #FOMO “Fear of Missing Out.” When a coin starts to moon, dumb money rushes in. FUD “Fear, Uncertainty, and Doubt.” Another non-crypto term that describes attempts to scare weak-handed coin-holders into selling their positions, often with rumors of exit scams or hacks; the cheap, dumped coins are then picked up by the FUD-ers. Hard Fork A type of fork that renders previously invalid transactions valid, and vice versa. This type of fork requires all nodes and users to upgrade to the latest version of the protocol software. Halving Bitcoins have a finite supply, which makes them a scarce digital commodity. The total amount of bitcoins that will ever be issued is 21 million. The number of bitcoins generated per block is decreased 50% every four years. This is called "halving". The final halving will take place in the year 2140. Hash The act of performing a hash function on the output data. This is used for confirming coin transactions. Hashrate Measurement of performance for the mining rig is expressed in hashes per second. Mh/S (mega hash per second)is the speed that a graphics processor, GPU, can hash per second. Hodl From Reddit: HODL is used for "hold" - it's a term that was invented by a psycho who did a typo and it became famous. Whenever people talk here (reddit website) about holding their coins, they would rather say "hodl your bitcoins". Also "hold on for dear life". Hybrid A hybrid PoS/PoW allows for both Proof of Stake and Proof of Work as consensus distribution algorithms on the network. In this method, a balance between miners and voters (holders) may be achieved, creating a system of community-based governance by both insiders (holders) and outsiders (miners). Initial Coin Offering (ICO) An Initial Coin Offering (also called an ICO) is an event in which a new cryptocurrency sells advance tokens from its overall coinbase, in exchange for upfront capital. ICOs are frequently used for developers of a new cryptocurrency to raise capital. Ledger An append-only record store, where records are immutable and may hold more general information than financial records. Litecoin A peer-to-peer cryptocurrency based on the Scrypt proof-of-work network. Sometimes referred to as the silver to bitcoin's gold. Long Term Hold The Term for holding onto AltCoins for a long amount of time, generally weeks to months or years, before selling or trading them. Market Cap Refers to the overall value of a cryptocurrency. It is found by multiplying current supply of coins by the market value of a coin. Mining The process by which transactions are verified and added to a blockchain. This process of solving cryptographic problems using computing hardware also triggers the release of cryptocurrencies. Medium Term Hold The Term for holding onto AltCoins for a medium amount of time, generally hours to days, before trading them for a different coin. Mountain Peak / Mountain Top A term for a candlestick on the trading platform being at it's highest peak before a dip. Moon Term refers to the price of a coin reaching extreme high’s. Multi Signature Multi-signature addresses provide an added layer of security by requiring more than one key to authorize a transaction.Multi signature addresses have a much greater resistance to theft. Node A copy of the ledger operated by a participant of the blockchain network. Off-Ledger Currency A currency minted off-ledger and used on-ledger. An example of this would be using distributed ledgers to manage a national currency. On-Ledger Currency A currency minted on-ledger and used on-ledger. An example of this would be the cryptocurrency, Bitcoin. Oracles Oracles work as a bridge between the real world and the blockchain by providing data to the smart contracts. Peer to Peer Exchange A person who owns bitcoin or other cryptocurrencies willing to sell it to you or you buy/sell to them. Permissioned ledger is a ledger where actors must have permission to access the ledger. Permissioned ledgers may have one or many owners. When a new record is added, the ledger’s integrity is checked by a limited consensus process. This is carried out by trusted actors — government departments or banks, for example — which makes maintaining a shared record much simpler that the consensus process used by unpermissioned ledgers. Ponzi Where a lending platform is setup to accept payment but eventually disappears before fully paying back their investors. Usually when they claim to payout more than they can actually afford to. Always look for red flags with investing platforms before investing or you could potentially risk losing your entire investment. P2P Peer to Peer Peer to Peer (P2P) refers to the decentralized interactions between two parties or more in a highly-interconnected network. Participants of a P2P network deal directly with each other through a single mediation point. Public Address A public address is the cryptographic hash of a public key. They act as email addresses that can be published anywhere, unlike private keys. Private Key A private key is a string of data that allows you to access the tokens (cryptocurrency)in a specific wallet. They act as passwords that are kept hidden from anyone but the owner of the address. Proof of Stake A consensus distribution algorithm that rewards earnings based on the number of coins you own or hold. The more you invest in the coin, the more you gain by mining with this protocol. Proof of Work A consensus distribution algorithm that requires an active role in mining data blocks, often consuming resources, such as electricity. The more 'work' you do or the more computational power you provide, the more coins you are rewarded with. Pyramid Where an organization is setup on a referral to referral basis constantly accepting investments with locked contracts in order to hold onto investors money. The more people underneath each other investing in the system, is the only fuel for maintaining these infrastructures until they can no longer withstand the demand for payouts. At this time, they will generally disappear or crumble. Ripple A payment network built on distributed ledgers that can be used to transfer any currency. The network consists of payment nodes and gateways operated by authorities. Payments are made using a series of IOUs, and the network is based on trust relationships. The banking industry is adapting this platform. SHA-256 SHA-256 is a cryptographic algorithm used by cryptocurrencies such as Bitcoin. However, it uses a lot of computing power and processing time, forcing miners to form mining pools to capture gains. Short Term Hold The term for holding onto coins for a short amount of time, usually seconds to minutes and sometimes a few hours before trading them. Soft Fork A soft fork differs from a hard fork in that only previously valid transactions are made invalid. Since old nodes recognize the new blocks as valid, a soft fork is essentially backward-compatible. This type of fork requires most miners upgrading in order to enforce, while a hard fork requires all nodes to agree on the new version. Solidity Solidity is Ethereum's programming language for developing smart contracts. Stream ciphers are a method of encrypting text (cyphertext) in which a cryptographic key and algorithm are applied to each binary digit in a data stream, one bit at a time. Testnet A test blockchain used by developers to prevent expending assets on the main chain. Token is a digital identity for something that can be owned. Tokenless ledger refers to a distributed ledger that doesn’t require a native currency to operate. Transaction Block A collection of transactions on the bitcoin network, gathered into a block that can then be hashed and added to the blockchain. Transaction Fee All cryptocurrency transactions involve a small transaction fee. These transaction fees add up to account for the block reward that a miner receives when he successfully processes a block. Unpermissioned ledgers such as Bitcoin have no single owner — indeed, they cannot be owned. The purpose of an unpermissioned ledger is to allow anyone to contribute data to the ledger and for everyone in possession of the ledger to have identical copies. Volatility Volatility is a measure of the price movement of an investment over time. The cryptocurrency markets are well known for their high levels of volatility. Wall A term used for an extremely high candlestick followed by several more so steep that there's bound to be a hard dip afterwards. Wallet A file that houses private keys. It usually contains a software client which allows access to view and create transactions on a specific blockchain that the wallet is designed for. Whale Anyone who owns at least 5 percent of any given coin, often used as a boogeyman to explain unwanted price movements. Whitepaper A document released by crypto startups that highlights the strengths and purpose of the platform.